Having picked up the first volume of Age of Sigmar today, I felt I should post as much information as I can so that my fellow Heretics can understand the new lore and history of the Mortal Realms and the War Against Chaos. I will be dividing the information into Chapters so that it is organized and not overwhelming on new info. Into darkness he fell, a glimmering streak in the endless black void. It was Dracothion, the Great Drake, that first beheld Sigmar. He was clinging to a lustrous sphere of shimmering sigmarite that hurtled unchecked through the dark ether. Entranced by the gleam of its core, Dracothion chased the careening orb, seeking to capture it and set it in the Heavens to better admire its beauty. Only then did the Great Drake notice the battered form of Sigmar gripping the pitted metal. Sensing a kindred spirit, Dracothion revived the god with a warming breath and permitted him to ride upon his back. Sigmar was grateful and thanked Dracothion, bestowing gifts upon the Great Drake. 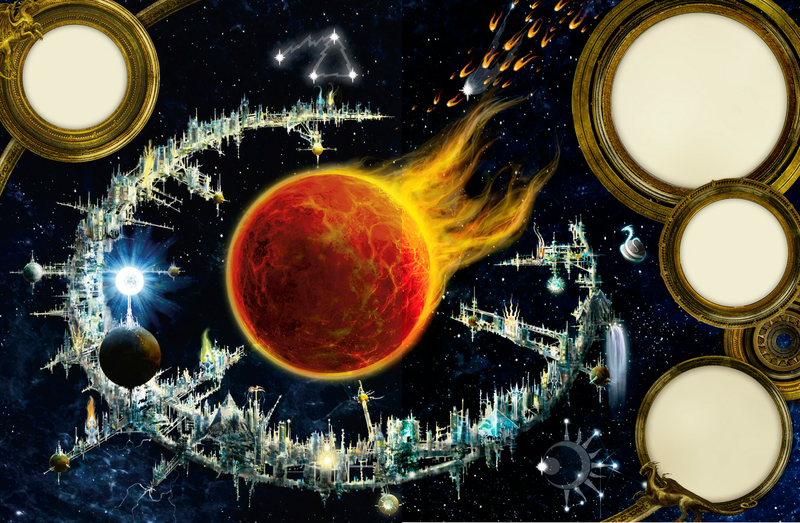 In turn, Dracothion showed Sigmar hidden paths - star bridges and crystalline pathways - that led to each of the Eight Realms. Thus began the Age of Myth. The Ages of the Mortal Realms are divided into three distinct epochs that have shaped the Realms. The Age of Myth, the Age of Chaos and the Age of Sigmar. After being found by Dracothion both he and Sigmar discovered that the God-King was not the only survivor of The World That Was, which Dracothion had hung in the cosmos and named Mallus. Its core was an anchor against the storm, a lodestone for the echoing souls of those who sought to deny Chaos its ultimate victory. Memories have great power, especially those of vengeful souls. Those of embittered gods are the most potent of all. Like seeds that weather winter to sprout anew in spring, Sigmar and the other lost divinities of that world began to grow stronger once more. All bar the God-King himself slumbered in an unknowable limbo, but the fallen were nourished nonetheless by the ever-shifting magics that saturated Mallus. Their memories and dreams slowly shaped the grand sphere’s eldritch aura, coalescing into forms that had a presence in the material universe. When the suns and moons of the heavens glowed bright, the surface of Mallus surged and flickered with the light of a billion lost souls, hosts of the vengeful that were one moment corporeal, the next as diaphanous and incorporeal as ghosts. These shadows of a bygone age were not alone. There remained those warriors and seers who had escaped the unbridled destruction of Chaos, who had sheltered in otherworldy havens, passed into mirror dimensions, or been swallowed by the Realm of Chaos only to fight their way back out. But for every soul that somehow clung on to existence, there were thousands who were gone forever. In many ways, it was this grand outrage that gave the survivors a sense of purpose, a bitter need for vengeance, and a material form. After discovering the Realms, still covered in the dew of creation, Sigmar and Dracothion went on a great voyage across each of them, both of them journeyed far and wide, finding enclaves of primitive humans and monstrous beasts. Sigmar taught mankind many things and in turn he was worshipped as a God-King again. There are many tales of Sigmar's encounters in this time; such as how he slew the Hydragors that guarded the gates to the Realm of Shyish, and how there he found the fallen god Nagash buried under a mountain-cairn and freed him; or how he freed the Realm of Aqshy from the tyrannical rule of the Volc-Giants. Everywhere Sigmar went he found more humans, trapped under the oppressive yoke of beasts and monsters, and everywhere he went Sigmar dispatched them and brought freedom and pride to his new subjects. Meanwhile in the Realm of Hysh, Tyrion of Cothique awoke from his long slumber to find that he had been elevated to godhood. The Lord of Lumination had finally risen. Discovering his brother Teclis, also raised to godhood, next to him and that the now-blind God of Light could see through his brother's gaze, Tyrion set about shaping the Realm of Hysh, but they were alone in this new and strange world. When the Twin Gods found Sigmar they were pleased, but despaired to learn that outside the still-growing city of Azyrheim, there were no signs of Aelfkind. Both swore allegience to Sigmar and joined his growing pantheon. While exploring the Realm of Chamon Sigmar found the Duardin Gods Grungni and Grimnir imprisoned at the top of the Iron Mountains. How they came to be there, they would not say, but each readily swore the oath of allegience and set about repaying their debt to Sigmar. Grungni, now crippled in form and unable to raise his hammer and fight alongside his brother-god, promised to fabricate whatever Sigmar desired as his smithing skills were unharmed. Grungni gathered the remaining Duardin and established the Iron Karak, a bastion of the Steamhead Duardin that would always answer Sigmars call. However Grimnir was a warrior and asked Sigmar to name an enemy worthy of his axes and that it would die, Sigmar named Vulcatrix the Mother of Salamanders that terrorized the Realm of Aqshy. Though the battle was titanic and created the Plains of Aqshy by it's very occurence, the end result was that both the Slayer God and the Ur-Salamander destroyed each other. Where the hoat coal remnants of Vulcatrix landed a new volcano was born, but where Grimnir's fragments ended up is a mystery that the Duardian share with no one. In the Realm of Ulgu, a new being awoke. This being with little memory of himself could not control his own solidarity, a fact that enraged him. As his anger grew, so did his physicality, and thus Malerion, once Malekith the Witch King, now a twisted being born of the Chaos-fuelled merging of Malekith and his dragon Seraphon, explored the Thirteen Domains of Ulgu. He found many strange beings but no signs of Aelfkind, apart from one. In a glade of Shadow Daemons he found a bacchanal staged by a enrapturing she-aelf, one that Malerion recognized. His own mother Morathi, changed in ways not recorded. Mother and son, remembering their final actions towards each other in the World That Was, were not happy to be reunited, but made an uneasy truce and united under Sigmar, joining the Great Alliance. In the Realm of Ghur Sigmar discovered the twin-headed God of Orruks and Grots known as Gorkamorka, trapped withijn the Drakatoa, a living avalance that ruled Ghyrria. Destroying the amber-massed monster, Sigmar and Dracothion freed Gorkamorka, believing that the Orruks that infested each of the Eight Realms would make fearsome allies in the fight against Chaos. Gorkamorka was pleased to be freed, yet infuriated that he had required help at all. Attacking his benefactor, Gorkamorka knocked Dracothion senseless with a single blow of his club, and in response Sigmar began what turned into a twelve-day battle. During this epic confrontation the Eight Realms themselves shuddered, when Sigmar flung Gorkamorka down from the sky the resulting blast created the Mountains of Maraz, while errant strikes from Gorkamorka's club created the Gouge Canyons. After twelve days both gods were weary and upon seeing the wreckage they had created, and the audience of beasts that had paused to watch this once-in-an-eternity confrontation, both Sigmar and Gorkamorka began to laugh. They grasped each other's hands and agreed to fight alongside each other, Gorkamorka seeing an equal in strength that would lead him to many great battles. In the Realm of Ghyran Sigmar found Alarielle, now the God of Life, and recruited her to join his pantheon. How he did this is not recorded as of yet. In Ghyran Alarielle found a realm that abounded with life in all it's forms; living mountains strode aross eternal forests, geysers birthed spumes of colourful birds, and glittering streams graced floating gardens. Though Alarielle was grateful to the man-god for awakeningher, she found solace in nature alone and after centuries of wandering through her new garden world, she revealed her own secret. The Everqueen bore magical seeds harvested from Athel Loren in The World That Was, and as she sowed these seeds in various conditions across all of Ghyran, a race was reborn. The Sylvaneth, once called Treeman and Dryads and a myriad of other names, flourished in this magical forest world. Aelven spirit beings found a home there as well, and Ghyran was truly at peace. Finally Sigmar alighted into the Heavens and discovered the Celestial Realm, the Realm that would be his. In gratitude towards Dracothion for all his help, Sigmar forged a necklace of pure sigmarite and gifted it to the being that helped make this second chance possible. The great city of Azyrheim was built around Mallus, and from this incredible place the Grand Alliance of Gods was forged with the God-King Sigmar at it's head and peace was spread across the Mortal Realms. As grand as the Alliance was, cracks soon began to form in it. Gorkamorka, though filled with respect for Sigmar, felt outright hate or contempt of his fellow gods and caused unrest wherever he went. Tired of this, Sigmar dispatched Gorkamorka to clear the wild countries, a task that suited the Sometimes Two Gods perfectly. Meanwhile Alarielle, now tired of both mortal and immortal company and pining for The World That Was, desired only to nurture her crops, spending more and more time in the Realm of Ghyran and rueing having to return to the Vault Celestial for councils and endless bickering among brother and sister gods. The greatest fracture came when Malerion and Tyrion, both still eager to find signs of Aelfkind beyond their own realms and Azyrheim's golden walls. They could find nothing in the land of waking, but in their dreams both the gods of light and shadow heard endless screams and cries, the sounds of the damned undergoing eternal torment. It was at the ending of The World That Was that Slaanesh, youngest of the Dark Gods, feasted mightily upon the endless stream of Aelven souls that came to him, so great that by the final end of what was, the Dark Prince was bloated and helpless. Seeing an opportunity to at last remove a fellow God and rival from the Black Pantheon, Tzeentch manipulated Khorne and the newly born Aelven Gods into a quest that saw the Dark Prince's realm invaded by the hordes of the Blood God and the Prince himself stolen from his throne by the Lords of Lumination and Shadow. But in pursuing their own goals, Malerion and Tyrion weakened the Great Alliance by being derelict in their duties to Sigmar. Next came the first betrayal. Tired of the tedious orders and constricting laws of his fellow Gods, Gorkamorka could take no more. With no warning the twin-headed god snapped and gave a deepthroated roar of 'WAAAAGH!' that sent the Orruks to new heights of rage. The invasion that followed swept across the Eight Realms, devastating them; cities were crushed, armies were trampled, and allies were destroyed in an avalance of green skin and crude choppas. Upon reaching the edge of nothingness - the abyssal World's End - Gorkamorka turned his forces around and set off to do it all again. The Great Waaagh! ended only when the greenskin tribes became mired in endless infighting, and Gorkamorka himself fractured into the twin gods Gork and Mork and succumbed to same arguments and infighting that plagued their children. Since that day Gorkamorka has reformed several times, each time heralding a new Great Waaagh! that unites the Orruk tribes into a wave of death and destruction, but no Great Waaagh! has ever been as devastating as the very first. But this age was not to last forever, for the Dark Gods had their gaze fixed upon the Mortal Realms. Khorne, Nurgle, Tzeentch, and soul-bloated Slaanesh before his capture, coveted what they saw and began making plans to invade the newly born Realms and corrupt everything within. However the Realms proved their greatest challenge yet as they naturally resisted the incursion of Chaos. Only the mightiest of the Greater Daemons or the Gods themselves could open the veil between realms, and even then the fissures they tore were temporary things that closed quickly. This did not stop them and Daemons like Ghorghax, commander of the Rage Legion, and Kairos Fateweaver, Oracle of Tzeentch, led horrific incursions into the Eight Realms. At first these invasions were paltry things led by slaughter-mad Daemons that quickly dwindled in numbers as the valiant defenders of the Mortal Realms sent the Daemons screaming back to the Forge of Souls, but this did not last as the Dark Gods began combining their powers to open greater and greater rifts, allowing larger armies to enter the Eight Realms. As more and more rifts were opened the Age of Myth entered it's final era, made possible only by the capture of Slaanesh. The Dark Gods, ever greedy for more power, began fighting among themselves to seize the captured Dark Prince's territory for themselves. After centuries of war between the Fell Powers, they finally turned their gaze to the ultimate prize, the Eight Realms. And with that, the Age of Myth was over and the Age of Chaos began. Last edited by Lord of the Night; 07-20-15 at 08:43 PM. Teclis lives! This makes me so happy, and confirmation that both he and Tyrion have elevated to Godhood too. I can't wait for new Aelf models. Only bit I was unclear of from the wording, one of them is blind now? I'm guessing it was Teclis. Thanks for doing this. I enjoyed your run-downs during the End Times, they were much better then my aborted attempt at Khaine. Although he could no longer see, Tyrion felt the glowing presence of his brother Teclis beside him. Tyrion awakened his brother and discovered that he could see through Teclis' eyes. So Tyrion can no longer see through his own eyes, but it does not say why. Slowly reading through my own copy ATM. A little dissapointed with the repetition of "signature warriors punching khorne dudes and visa versa", and lack of detail on the new cultures/races. Feel as though there could have been richer content in a book of this size. Grumble over, I'm loving what news is In here. Morathi sounds like an interesting new player (thinking she may be the one to take slaanesh's throne now). And the red slayers sound and look awsome. I'm especially excited because it specifically states they can fight alongside chaos, and being based in the realm of fire their a perfect match to my khorne army! Over all reall excited by what he have so at and what the futures to brkng. So we now have a blind warrior God of Light? Well that's my favourite character decided. The Black Years, the Reaving Time, the Great Slaughter. It was called many things, an era of long defeat, an epoch of brutality - it was the Age of Chaos. For many hundreds of years the forces of the Dark Gods ruled triumphant, their armies mercilessly grinding all beneath iron-shod heels. Seven of the Eight Realms were overrun, and spike-ridden fortresses erected to stand guard over ruined wastelands. These strongholds were malfeasance made manifest, and each drained the land's essence and spilled forth the baleful energies of CHaos. All who opposed the conquerers were hewn down, their short-lived empires torn asunder, their histories consumed. All were drowned in blood. Still the Dark Gods remained unsatisifed, for boundless was thirst for destruction and decay, change and corruption. So grew the power of Chaos, spreading across the Mortal Realms. It seemed the onslaught would not cease until the stars themselves were torn down into oblivion. With no opposition to deny them, the Dark Gods gloated. They revelled in the corruption, sure that final victory could soon be theirs. Thus far Sigmar's alliance had kept the Dark Gods and their armies at bay. It was Tzeentch that continually pushed for a combined invasion into the Eight Realms, but Khorne and Nurgle were wary of their manipulative brother and each wanted their own Champion to lead the way. These disagreements threatened to reignite the Daemon Wars that allowed the Age of Myth to survive for centuries more than it would have, only the suggestion that a particular mortal champion command the invasion kept the Fell Powers allied. And so it was decided that Archaon, The Ender of Worlds, would lead the armies of Chaos once again, and soon the Great Invasion began. Each Chaos God demanded Archaon's sole patronage, for this time the Gods each wanted their own Champion to lead the final victory, not an Everchosen loyal to all and devoted to none. Archaon refused, and was forced to overcome each of the Dark Gods wrath, for each God feared that Archaon would eventually serve one of their rivals. Archaon overcame each trial, emerging stronger than before, and proving to the Dark Gods that Archaon could not be made into a devotee. Archaon gathered a great army to him as he had done in ages past, and in his wake he planted the banners of all the Chaos Gods, bar the Horned Rat whom the Ender of Worlds decried as unworthy. Having failed to destroy reality, Archaon had a new goal; to subsume the Eight Realms into the Realm of Chaos and rule them as Overlord. It was his destiny, and his right, and none would stand in his way. The Gods ceased in their efforts to slay Archaon; Khorne saw a warrior unbowed, a killer that would never be moved by politics or plotting; Nurgle saw a corrupter of the highest calibre, a force of nature who would leave nothing but death in his wake; and Tzeentch - more suspicious than any of his brothers - conceded that there may be more to Archaon than even he had seen. Gifts were bestowed, and once again Archaon, once Diederick Kastner of the Empire in The World That Was, was crowned The Everchosen of Chaos. Archaon's first goal was to capture the Allpoints Bridge, a nexus point of reality that connected all Eight of the Realms and could be used to reach each realm easily. Great cities had sprung up around these Nexus Points, for these were the most stable method of travel between the Realms. The Nexus Wars had begun. Archaon, using the tactical acumen that saw The World That Was destroyed, simultaenously masterminded attacks that saw all Eight Nexus Points threatened. The Nexus Wars were a time of incredible history when the very Gods themselves walked among their children and fought to defend their realms, both sides boasted of legendary deeds and horrific defeats. But it was defeat and betrayal that saw the Nexus Wars end, when the Shyish Arcpoint was taken and fighting spilled onto the Allpoints - The Bridge To Everywhere. Sigmar's alliance had been battered by Gorkamorka, treated as peripheral by Tyrion, actively undermined by Malerion and ignored by Alarielle. But when the Forces of Death suddenly turned on Sigmar's forces at The Battle for the Shyish Arcway it was the true end of the Great Alliance. Sigmar, overcome by the betrayal of Nagash, left the battle, abandoning the defence to the dead. Consumed by rage, Sigmar cast aside the aspect of the diplomatic God-King that he had become again and reverted to the barbarian warlord he had been in his mortal life. Even as Archaon and his forces captured the Allpoints, corrupting the realmbridge and assuring that no realm was safe from them now, Sigmar stormed the Amethyst Realm in what would come to be known as The War of Heaven and the Underworlds. All across Shyish Sigmar sought the traitor Nagash, bellowing insults of cowardice and treachery at the Lord of the Amethyst Realm. Nagash's emmissaries were ground to bone dust and his armies scattered into wreckage, for none could stand against the God-King's wrath, while the realms he had sworn to protect were ravaged and raped by the hordes of Chaos. Eventually with his berserker fury spent, Sigmar led his armies to the realms he had neglected to salvage what they could, leaving Nagash to deal with the encroaching Chaos armies. Perhaps Nagash could have stood against Sigmar alone, but as soon as the God-King marched out for revenge, another threat rose up. The Skaven, with suspiciously perfect timing, rose from their gnawed tunnels and assaulted Nagash's armies in their chittering hordes of millions. This was known as the War of Bones, and though it was fought to a standstill, it weakened Nagash so greatly that when Archaon and his armies came, their victory was assured. Only the darkest underworlds survived under the Lord of Death's reign, and as Archaon himself smashed Nagash to bone-dust the Amethyst King recoalesced on his throne, forced to watch as his realm fell to the enemy he had believed he could defeat alone. In Ghyran the rotting hordes of Nurgle laid siege to the Realm of Life, for the Grandfather had always coveted these bountiful lands from the moment he saw them, and perhaps even their beautiful ruler as a replacement for his Poxfulcrum, lost in the sundering of The World That Was. The War of Life raged for centuries, the Dryads and Treekin fightering bitterly and brutally for every inch of verdant soil, but the plagues and soldiers of Nurgle were endless and eventually the war was lost. The Plaguefather held sway, only mystically hidden vales and groves were safe for Alarielle and her surviving children as the rest of her once-breathtaking realm began to rot. By the time Sigmar returned, the Allpoints had fallen and become corrupted by Chaos, becoming the Eightpoints, a road directly into the very heart of Chaos that allowed uncounted legions of Daemons to enter the Eight Realms as easily as their own territories in the Outer Darkness. Centuries of slaughter followed as Chaos took victory after victory; a spearhead of Bloodthirsters cracked the walled cityof Ulgarod and flooded the streets with gore, the Pandaemoniad of Tzeentch took the city of Chamontarg and transmuted the doomed populace to stone. Rotplague destroyed the greatest civilisations of Ghyran. Eventually all fell, with the final empire of mankind known as the Lantic Empire being personally crushed into dust by Archaon. With the fall of the Lantics, seven of the Eight Realms were lost to ruin, and only one thing could be done. Sigmar retired to the heavens, to the great city of Azyrheim in orbit above Mallus (http://1d4chan.org/images/d/d0/Age_Of_Sigmar_Map.png) and shut the Gates of Azyr, condemning the other realms to the fickle whims of the Dark Gods, but preserving his own realm and the millions of souls who had taken succour there when the invasion began. In Azyrheim Aelf, Human, Duardin and many others lived in peaceful co-existence; all dreaming of the day when they could return to the lands they had forsaken and exact revenge upon the Dark Gods. Sigmar sat upon his throne and planned to overthrow the vile rule of Chaos, his mood tied to Mallus, the remains of the Broken World, and as it waxes so does he, becoming full of life and energy. As it wanes, Sigmar’s outlook likewise blackens. As the centuries passed a ring was built around the Broken World as Sigmar watched it and brooded over his failure to protect both it and these new realms from Chaos, but soon the God-King decided on a new course of action, one that would either see Chaos defeated once and for all, or would be the final failure that would see Chaos ascendant for eternity. And Dark Dharroth Glooms There Also. Awaiting Only The Call To Battle. Last edited by Lord of the Night; 07-20-15 at 09:03 PM. Thanks for the summary. An excellent and informative read. and in his wake he planted the banners of all the Chaos Gods, bar the Horned Rat whom the Ender of Worlds decried as unworthy. Damn straight, Archaon! Disgusting rats.